Keeping your data online is a good idea but not all online backup services will suit your expectations. Recovering and uploading your computer files or data can be a very big task. Specifically, the bandwidth that you are having in your location and the provider that controls your bandwidth can make this procedure either difficult or easy. More and more online backup services set limitations on how much or how many documents you can store at a specified period. This will mean that you trust your own hard drives to them for preliminary data broadcasting and then you will be sending your hard drives for file retrieval. In the end, this may result to unavailability to access your data fast. Having this as an issue, Symform is now created and self-proclaimed to be the fastest online backup. Let’s find out why. 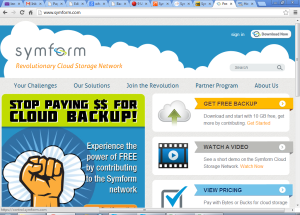 Is Symform the fastest online backup? Symform as online backup service and compared to other online backups may be the answer to your problem. The service prides itself of having no central pipe, no data capacity limits and no bandwidth throttling which makes it the fastest online backup. It also has a distinctive characteristic intended to solve problem in speed like hot copy and turbo seeding. Parallel internet connections. Symform simultaneously distributes 96/96 pieces at different servers on available networks to similar connections on the internet making it simple and accelerating the preliminary seeding. It also has different data centers. This more likely avoids sharing bandwidth with hundreds or thousands of other servers. Data recovery. Symform’s hot copy allows you to create a copy of your data in an instant at a secondary physical location. During recovery, Symform brings data fragments back from the cloud by putting the internet connections parallel and enabling you to restore data faster as compared to traditional solutions. Configurable bandwidth optimization. Another special feature of Symform is that you can select how many bandwidths you desire to use. You can easily program the day and even the time when you want Symform to do heavy work. Reliability and durability. As you may have experienced, hard drives and other servers may fail. We, human beings can also make some terrible backing up errors. That’s why aside from faster back up processes, Symform is reliable. In traditional data center environment, the possibility of failure of the hard drives and servers is high. Even with virtualization and redundancy, failure can happen. With Symform, your documents or data are guaranteed lifelong durability and capability of surviving whatever failure or errors from any fortuitous and man-made disaster such as fat-finger file delete, devastating fire, theft or plain human stupidity. Symform has disseminated online networks. It also needs thirty three physically unrelated hard drives to break at closely same time just before any documents or data are lost from the customer. It is protected by “RAID 96”computer technology program. It has also globally disseminated network assurances; this means that your data will always be there safely in times needed. With many positive reviews on Symform, it may be the fastest online backup yet you have to try it to know better.